Since its launch in 2015, LE CHÂTEAU’s Wedding Boutique has become the one-stop bridal destination for styling wedding parties head-to-toe. From bridal gowns to sparkly shoes and accessories, bridal party attire to luxe suits for the groom, the Wedding Boutique is here to make your wedding day all the more magical and lovely. New collections launch each season, so you will be sure to find fashionable and fabulous outfits – no matter your wedding style. Wedding planning can be a stressful time, so the Wedding Boutique strives to make bridal dressing as effortless as possible. Brides, grooms, bridal parties and guests can all find their perfect look from the selection of gowns and formal suits online, as well as in select stores. 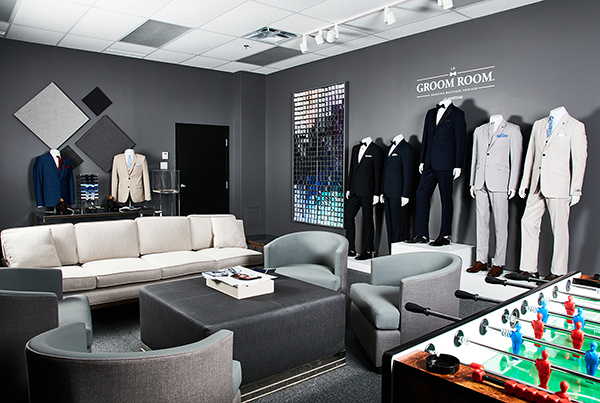 For a more personal experience, the Wedding Boutique additionally offers complimentary styling sessions at its Montreal-based Wedding Suite and Le Groom Room. A perfect selection of show-stopping, on-trend gowns and suits for the wedding, bachelorette party, bridal shower, and honeymoon can be found in these two beautiful and spacious suites. Along with trying on lots of gorgeous pieces until “the one” is found, the day is rounded out with complimentary refreshments and sweets for your entire party. Bridal parties can book the one-on-one appointment with LE CHÂTEAU’s wedding stylist, Charlotte, who can also assist with sizing, product inquiries, and any other personalized style advice the bride and bridal party may need. When it comes to wedding styling, LE CHÂTEAU’s Wedding Boutique has got you covered. Additionally, collaborating with other wedding experts allows us to better help brides bring their dream day visions to life. We have partnered with Mariage au feminin for their Concours Mariage QC. Together with many other experts in the wedding industry and ambassador Chloe Dumont, this 22-week contest offers a big prize of over $20,000 to one lucky couple for their dream wedding, including being styled in LE CHÂTEAU. Find out the full details of this contest on Mariage au feminin’s Facebook and Instagram.